These applications and services can be scaled up over time and deployed by customers to suit their needs. There are a number of operating system available in Azure including this version of Microsoft’s Unix, which is in fact a build of FreeBSD. This move will be a surprise for some as Microsoft diverges a little attention away from their primary OS (Operating System) Windows, but not so surprisingly it has been done to strengthen another products position by bolstering Azure’s capabilities. What Microsoft have done is produced a UNIX distro that is optimised to be run as a virtual machine in their cloud environment. More specifically they have optimised it for Hyper-V which is used by Azure as its virtualisation platform. To do this they have had to get their hand dirty in the coding of this UNIX build. This move has not only been seen as a positive one by Microsoft, but also by FreeBSD. In the words of Microsoft they have done it “to remove that burden” from the FreeBSD Foundation, who depend upon community contributions. The coding between Microsoft and the FreeBSD foundation will flow both ways and downloaders of the FreeBSD 10.3 image will be able to take advantage of this shared collaborations, as it has improvements coded by Microsoft built in. This is important as it means not only users of Azure will benefit, but also anyone who downloads a free copy of FreeBSD. It is also important to note that Microsoft have allowed FreeBSD to be utilised by users previously, but this was seen as a custom guest OS setup and users had to do all the leg work of uploading an image and getting it running on Azure. However Microsoft could not ensure the reliability of this UNIX guest OS and this is not a good place to be if their customers rely on it for their business, so it seems Microsoft wanted to overcome this by creating their own UNIX distro. As a result it is now available as a selectable option inside of Azure and more importantly it has been optimised by Microsoft to ensure stability and support offered for its use. This move is continuation of Microsoft collaborations to bring other virtual appliance to their Azure market place. Previous collaborations include Citrix, Negate and Stormshield, making Azure an ever stronger cloud platform for modern business computing. FreeBSD itself is recognised as operating system, of some merit having contributed to parts of the Apple OS X and also the likes of Juniper’s Junos used in networking hardware. It is noted by Microsoft that many “top-tier virtual appliance vendors base their products on the FreeBSD operating system” and there is a need for it in their market place. 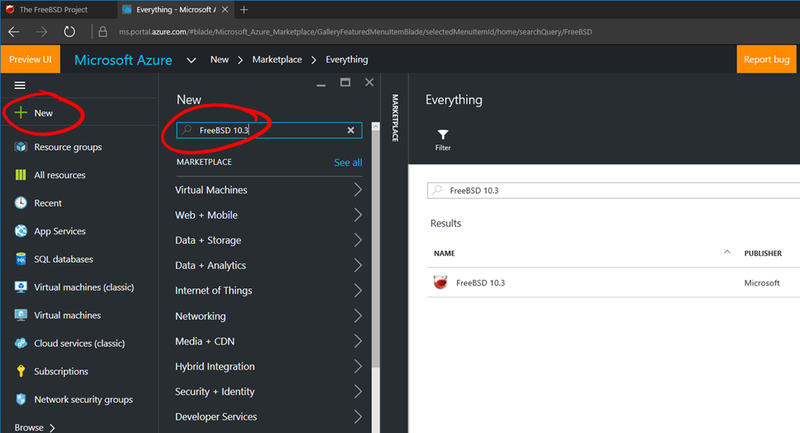 So if FreeBSD is a credible option for your business it is now available with an SLA from Microsoft in their Azure platform. To discuss cloud computing further and how it can be used to improve your business please feel free to send us a message.